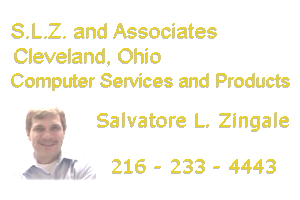 SLZ and Associates provides computer support services and Internet business and personal site development services for home and business clients in the Northeast Ohio region. Service is available for Cuyahoga, Lorain, Medina, Summit, Portage, Geauga and Lake counties. SLZ and Associates provides direct support service to Northeast Ohio clients for hardware, software, troubleshooting, maintenance and repair of IBM and compatible clone systems. Domain name acquisition services, site hosting services, Internet business site and personal site development services, marketing and advertisng are provided for customers throughout the United States. Call 216-233-4443 and leave a brief message with a best time to contact you.